An electrical fire can be scary and extremely dangerous, but there are ways to be prepared in case of an emergency. If one of your appliances goes up in flames, it’s important not to panic. Follow these simple guidelines to keep your home safe from electrical fires. You can stop electrical fires before they start by following a few basic rules of appliance safety. Be sure not to plug in too many devices into one outlet—the wiring can get overloaded and spark a fire, especially if there’s clutter like paper or clothes nearby the outlet. It can be easy to forget about the dangers of larger appliances since they stay plugged in all the time, but they can present as much of a fire hazard as small devices like toasters and heaters. Large appliances like washing machines and dishwashers shouldn’t be left running overnight or while you’re away from home, and avoid placing refrigerators or freezers in direct sunlight, to prevent overworking their cooling systems. Check all outlets regularly for excessive heat, burn marks, and buzzing or crackling sounds that might point to electrical arcing. Make sure you have at least one smoke detector on every floor of your home, and test them regularly to keep them in good working order. If a fire breaks out, it can be tempting to douse the flames with water, but water should never be used to put out an electrical fire. Water conducts electricity, and dumping water on or near a power source can give you a severe electrical shock. It might even make the fire worse. Water can conduct the electricity to other parts of the room, running the risk of igniting other flammable objects nearby. The first thing you want to do is unplug the device from the power source and call the fire department. Even if you think you can take care of the fire yourself, it’s important to have backup if the flames do get out of control. For small fires, you may be able to use baking soda to smother the flames. Covering the smoldering or burning area with a layer of baking soda can block oxygen flow to the flames with minimal risk of electrocution. Baking soda also contains sodium bicarbonate, which is the same substance used in standard fire extinguishers. You might be able to smother a small fire using a heavy blanket as well, but only if the flames are small enough not to catch the blanket on fire too. For larger fires, use a Type C fire extinguisher. You should always make sure you have at least one Type C or multi-use extinguisher in your home. 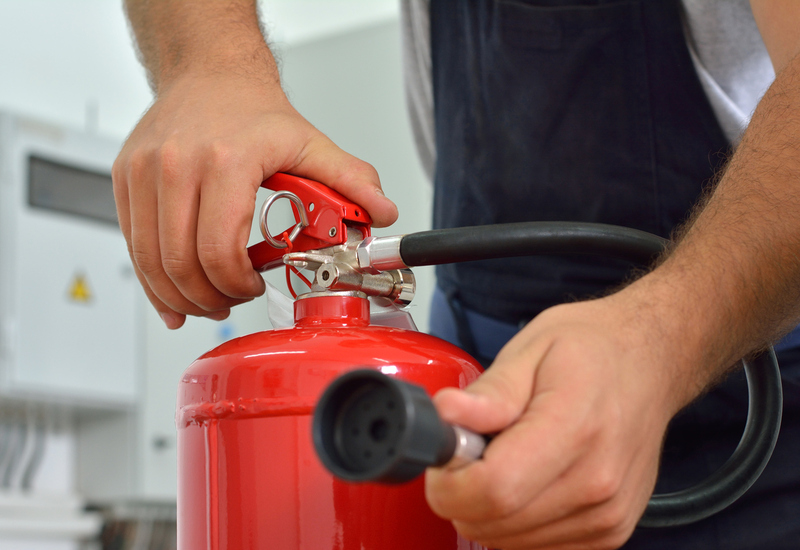 Extinguishers should also be checked regularly to make sure they haven’t expired. If you have a working extinguisher on hand, just pull the pin at the top, aim the nozzle at the source of the fire, and squeeze the handle. If the flames get too big to fight alone or you think the fire might block an exit, leave the building immediately, close the door behind you, and wait for help from the fire department.